The #1 goal I get asked about in regards to strength and conditioning is how an athlete can increase their speed on the ice. Rightfully so, as speed of movement (in reference to Yuri Verkhoshansky’s research) is the most powerful physical component a hockey player can bring to perform at their absolute best. Speed is the intersection of many different qualities within an athlete that are placed in the correct balancing act so that one may not overpower another (free explosive speed package here). One of these qualities that contribute to speed development is agility. 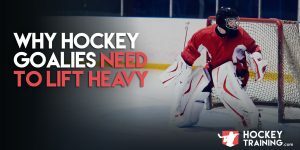 Although your top speed (the fastest you can go on the ice, no matter how long it takes you to reach that pace) can help on the ice, agility is MUCH more important for hockey players. Your starting speed, explosiveness, deceleration, and high-velocity direction change are very dependent on how agile you are. Put another way, if you have a blazing fast 5th gear of speed, but it takes you forever to reach that gear, how many times will that be of value out on the ice? Rarely, if ever at all. The game of hockey moves incredibly fast and it’s not so often you have open ice in front of you to skate straight ahead and try and find your top gear. More often than not there is a ton of external stimuli going on with the play – things such as the position of the opposing players, the position of your players, the position of the puck and what’s going on in your mind – that will almost always break up this straight away course. This is why the development of agility is a highly desirable trait out on the ice. If you can move swiftly and have a very quick stop/start speed, you have a distinct advantage over those who can’t. Regardless of their top speed. Agility in and of itself heavily involves both physical and mental qualities within an athlete. Most people assume the physical part. I mean that just makes sense, right? Physically train for agility and you become more agile. What many people seem to forget though is how important the mental aspect is behind what I would consider a more thorough and complete look at what agility truly is. Agility demands you have a strong mental game, and when it comes to hockey this requires mental agility, emotional comfort, and a high level of confidence. Mental agility can be thought of as your ability to follow two conversations at once. You need to have the vision, attention span, and focus to be able to read what’s in front of you in unpredictable environments. A game setting is as unpredictable as it gets, in just a matter of a few seconds, all of the players on the ice will have changed their position and the puck can/will be far from where it originally was. If you can’t foresee the actions of those around you and read where the play is going to be (and not where it is right now), your ability to be agile can suffer greatly. Because a mental block is a physical block. You may have all the physical components in the world, but if you’re not “in the zone” it doesn’t matter what your body is capable of doing because your mind is making the wrong decisions. Take the example of female gymnasts in the Olympics. If you have a look at these girls – they are pretty much all have identical height, identical muscle mass, identical flexibility, and identical limb lengths. So, what makes them different than one another on that day? Whoever came the most mentally prepared is going to be the one who executes her routine most flawlessly. This plays out just the same in hockey. Maybe the first and only reference ever towards hockey using female’s gymnasts? Most likely. But I know you can level with me here and understand the analogy. Everybody has had that game or had that workout where their mind just wasn’t there. Their body was probably physically capable of performing better but it was being limited by your decreased mental performance. So, what do hockey players need out there to make sure they have this mental agility? You need these in order potentiate your maximal agility capability. Let’s have another more “real world” example on how confidence and comfort can have a huge impact on your agility. Let’s say this year you made it up to the next level in competition, you’re in the semi-pro’s now. But with the jump up you also had to move away from your friends and family to another city, play on a team that you have never played with before, and you’re also traveling much more than you have ever been used to. You’re probably not going to have the best hockey season this year. This is a lot of change and a lot to take on all by yourself. But, next year rolls around. Now you’re comfortable in your new city, you have a lot of new friends, you are used to your teammates now and know how they play – you’re also used to the traveling schedule now. You may not have actually changed at all physically, but your performance is going to increase drastically this year compared to your last year just because now you’re more comfortable and confident. This plays directly into your agility. The more confident and comfortable you are out there in a game setting, you more agile you will appear regardless of your physical fitness. Now let’s get to what everybody really came here for, the physical aspect to agility development. First and foremost, I have to say to you that as a professional strength and conditioning coach my job is to provide you with the best information possible in order to improve your game, whether that information is boring or not. I don’t post blogs to make headlines, I post blogs to get results. Which is why I am going to tell you that the absolute #1 thing you can do to improve your agility is to simply play the game. There is no getting around this. Playing the game of hockey is as sport specific as it possibly gets and the more comfortable and confident you can be out there expressing your skills on the ice the more agile you will be. Period. Nothing in the gym or off the ice can outweigh the benefits of this. Getting lots of ice time, scrimmaging at practice, and putting some time on the old pond with the boy’s plays into your favor here. Besides that though, what else can we do for agility? I think it’s important to define how agility works in the body first to properly understand how we can program for it and why some exercises are better than others. Agility is essentially a hockey player’s ability to effectively absorb and redirect forces. Played out in real life, this includes things like high-velocity direction change, explosive starting speed, exploding into different planes of movement, and deceleration. Looking at the above examples, the one overwhelming thing they all have in common from a physiological perspective is their association with relative strength. That is, how strong you are in relation to your body weight. If two men both weigh 180lbs and yet one is stronger than the other, this is an example of an increased relative strength. Knowing that agility is how efficiently and how quickly our bodies can absorb and redirect force, we can also say that agility is the demonstration of an eccentric to concentric contraction — or a “load” to “explode” action. How agile you are, depends on how fast your body can go from an eccentric (load) to concentric (explode) muscle contraction. Think about it like how fast you can hit the brakes and then immediately start re-accelerating in a different direction. A huge part of this is relative strength, but another part of it is power. Specifically, the amortization phase. Relative strength ties in here because the stronger you are in relation to your body weight, the more control you have over your body in movement. Take the example of two men who are 180lbs, one can squat 400lbs and the other can squat 200lbs. The one who can squat 400lbs will have much more control of his body in deceleration and high-velocity direction change simply because he is strong enough to overcome the forces that he is presenting upon himself during the game. Whereas the weaker opponent will be more likely to succumb to momentum issues trying to perform similar tasks. Additionally, relative strength plays into your explosive starting speed as a man who can squat 400lbs who is 180lbs will be much better able to press down on the ice and propel himself forward with more force than somebody who can only squat 200lbs. Giving the stronger opponent both a quicker start and a greater stride length. Now, digging a little deeper into the above-mentioned amortization phase for power development. 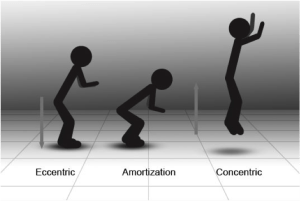 The amortization phase is essentially the measurement of the time spent in between the eccentric and concentric muscle contraction. This concept is crucial to optimal power development (and therefore optimal agility development) as there is a direct correlation between time spent in the phase vs. a decreased power output. Meaning, the longer you spend in the transition phase, the more and more power you lose from that stretch shortening cycle. Just picture yourself going for a standing vertical jump, your body’s natural inclination is to load and explode very quickly. We never extend the loading period. Why? Because we’ll get a weaker jump. Picture this out on the ice. Imagine if you had to spend time and load your whole lower body anytime you wanted to change direction or explode into a different plane of movement? No, it doesn’t work like that. It takes too long and on top of taking too long you actually lose power output. The quick load and explode takes advantage of the stretch shortening cycle within the muscle, in that you build up a type of “elastic” energy in the muscle and use it to rebound and explode. If we’re thinking about ways we can physically develop greater agility, we definitely should also be looking here. In order to maximize true agility, we need to train the body to take full advantage of the stretch/shortening cycle. To do this, we need to decrease the length of the amortization phase as much as possible because the longer the amortization phase lasts, the less elastic energy and power output we are able to express through that movement. For more information on power and the many roles it plays into hockey performance be sure to check out my hockey power blog post. Moving on from here we now know the mental aspects behind agility, what makes people agile from a physical perspective and how relative strength, amortization phase’s and power development play into this. Agility is the ability to be quick and graceful. You might have agility on the basketball court or in the courtroom, or even with your gaming remote. The noun agility can be used for both mental and physical skills in speed and grace. Quick and graceful. Sounds about right. A big part of this is simply how these hockey players actually move. What can both positively and negatively affect these movement patterns in an athlete? These two components are quite unforgiving. Take mobility for example, if you’re tight in certain areas of your body that are restricting optimal movement patterns, then no matter what you do you’re not moving with the correct technique to get the greatest result and the greatest energy economy. This means that no matter how mentally agile, relatively strong, or how powerful you are, if you’re tight you’re not going to be able to properly execute the techniques that would allow you to express this strength and power in agile movement. Simply put, if you’re not mobile you’re not moving right and if you’re not moving right you’re definitely not agile. That sounds pretty bad, right? But turn this around for a second. This means for you guys reading this out there who currently are tight in the hips, lower body, calf, and Achilles tendon – that just relieving these tightness’s alone without any further training can increase your agility. That’s some powerful stuff right there. If you aren’t allowing your body to move without restriction then how can you expect to meaningfully improve your agility? These same principals also apply to structural balance within the athlete. By structural balance I mean an athlete should have equal strength levels from left to right, and from the upper body to the lower body. If you’re one side totally dominates your other side, you’re not moving right. Additionally, hockey players are notorious for structurally imbalanced lower bodies due to the mechanics of skating. Alleviating these issues creates a quick increase in many physical qualities, agility just being one of them. For some much greater detail on these two extremely important aspects, check out my two blog posts on structural balance and mobility in my Hockey Correction series. I think it’s important we revisit a component of strength development that is heavily tied into your agility out on the ice, which is your core strength and stability. The body’s ability to effectively absorb and redirect forces relies heavily on how well your core is developed from the inside out, meaning both your inner and outer core chains need to be well-developed to optimize these forces in your favor. All power and forces are created from the ground up, but it is your core that allows you to maximally express this force output effectively and safely. The core is both transmitting all this force you are outputting, let’s say into a body check, but also at the same time stabilizing your spine and pelvis to prevent injury. Either way, not optimal for agility which is dependent on this type of explosive force. Your core strength is allowing your relative strength to express itself in multi-planar motion. Yes, relative strength is huge, but relative strength is limited by core strength in that you don’t want to be that cannon in the canoe. You need to be in a strong, stable battleship that isn’t going anywhere when you fire a shot off. I highly recommend you check out my core training blog post where I discuss this at length, but here are some of my favorite exercises for core development that are going to impact your agility. As you can see from what I mentioned in the beginning of this blog post, agility is the intersection of so many qualities at play. One cannot really just say “Hey Dan, what’s your best agility workout?” because this entirely resides on you and your current situation. One thing that can disguise itself as strong agility is good conditioning, which makes it worth a mention here. Even if you’re totally mobile, have great structural balance and everything else we have discussed here; if you gas out early in the game your agility is going to appear terrible. Even though it may not be at a fundamental level. Whereas another guy who may technically have less of these qualities than you but has a great gas tank even in the 3rd period is going to appear much more agile than you simply because he is better conditioned. Don’t let conditioning ruin your game, come in shape and allow your body to express what it has the ability to do. The two most deep-rooted training principals in sports science theory are specificity and overload and training on an unstable surface lacks both of these. It is a very far cry to try and deem unstable surface training functional or specific to hockey performance. When are you ever unstable like that on the ice? Why would you need to train it like that? All movement in hockey occurs because the athletes are moving, not the surface they are playing on. So unless you plan on playing hockey during earthquakes, it becomes difficult to make the connection between the two. But now that we know agility absolutely requires large relative strength levels we are shooting ourselves in the foot trying to squat on a ball. Anytime you incorporate unstable surfaces you sacrifice both how much weight you are capable of using plus the speed at which you are able to move that weight. We just decreased the weight so we are directly limiting our relative strength training, but not only that, we are moving slower! You don’t train slow to move fast. You need to move fast in order to recruit the high threshold motor units responsible for explosive movement. This really makes no sense from a physiological perspective, this is honestly like you going outside and playing basketball and telling me you’re working on your slap shot. It’s definitely not specific, and it definitely lacks progressive overload as you can only do so much on a ball. How many people do you see squat 400lbs on a ball? Zero. How many people do you see squat 400lbs on the ground? All the time. If you had to put money on it, who do you think is going to be harder to knock off the puck on the ice and is going to have more explosive movement, the guy who squats 135lbs on a ball or the guy who squats 400lbs on solid ground? Additionally, since we are also moving much slower it’s a guarantee that these athletes are increasing the amortization phase length as well creating another problem. If you move slow and train with low weight you’re going to be weak, and if you’re weak you’re not fast or agile. As far as the ladder and cone drills, they also lack specificity and overload. When do you ever move like this on the ice? When does a hockey player ever need this type of stride frequency? Never. Also once you get good with the ladder, how do you introduce overload from here? Agility is all about swift and graceful movement in unpredictable environments. Cone drills and ladder drills are pre-determined movement patterns. You can’t really say it’s a true function of athletic agility if you know exactly what you’re doing beforehand. You simply execute the pre-determined movement and then you’re done. This doesn’t replicate a hockey game situation from a mental or physical perspective. This is why I feel your time would be much better spent either strength training or getting a scrimmage together with your teammates/buddies. At least in the gym we can replicate the kinetic segments, muscle actions, intensities, and energy systems required for each athlete’s position out on the ice and train them effectively. Ladder and cone drills do none of this. Is doing unstable surface training and cone drills the worst thing in the world? 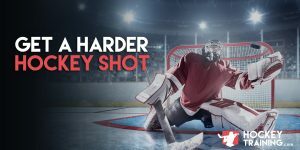 But when really dissecting hockey and looking at what will have the greatest amount of carryover to your on-ice performance, these methods fall pretty low on the list. Again, it’s my job as a coach to simply provide you guys with what works whether it looks cool on Instagram or not. I look at the sport of hockey and all its demands and match up what I feel are the most effective ways in which to train athletes into a high level of performance. This means creating a hierarchy of performance training methods and weighing the cost/benefit analysis. If this athlete can only train 4-5x a week, like most everybody out there, then I feel their time could be better spent doing different tasks. So what does the broad picture of agility really look like then? Overall, there is nothing too shocking about agility once it’s explained and laid out from a sports physiology perspective. A hockey athlete looking to improve their agility should have a well-designed periodized training structure both during the season and in the off-season, which encompasses hypertrophy (within the realm of specificity of course), strength, power, lots of ice time, and some mobility work. Provided your training systems are created well, the structural balance work should be incorporated right into the strength, power and hypertrophy phases. Last but not least, an athlete with a poor body composition is an athlete who is not agile. Good nutrition should be a focus year round, regardless of the goal. 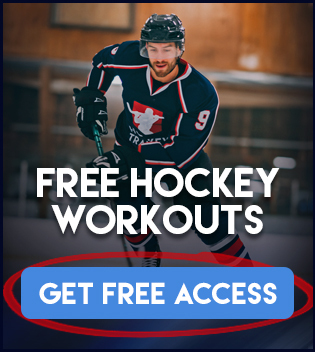 If you’re ready to take your hockey game to the next level, including improving your speed and agility check out our Hockey Training Programs. I’d like to have more precisions on reactive training and few exercises to do it. Thanks! Since agility is both mental and physical reactive training can become an effective tool as your mind has to be on point and alert. Agility is not just about direction change on the ice, but how your brain performs visual scanning, anticipation, pattern recognition, knowledge of the situation and reaction time. All this new stimuli occurs once direction change has been made where you have a new line of sight and this should all be viewed right in there with physical agility. Sprint and chase: Two athletes pair up and they are separated from each other by 10-15yds. They are both facing each other but the one in front is seated. How it works is the seated athlete is to get up turn around and sprint 15-20yds, but, the moment he makes a move his partner can begin chasing him. The idea is for the seated athlete to be fast and agile enough to explode and turnaround from a seated position and beat his partner to the finish line. Lateral Mirror drill: Two athletes’ pair up and face each other, one is designated the leader and the other the follower. Two cones are set up 5-10yds apart and the leader is to move laterally back and forth as fast as he can while the follower has to react and follow him the best he can. 10-20seconds of non-stop movement is followed up by 20-40secs rest in between rounds. What about using cones or hurdles for explosive movements, like jumping over them? This is great, no problems whatsoever. This stays within the realms of overload and specificity and keeps the athletes training the proper recruitment patterns for developing speed. I was mainly discussing cone/dot drills in the sense of pre-determined, short distance, high stride frequency running patterns. Great article. What are your thoughts on Yoga. Obviously there are some benefits, but how useful is it to agility? Pilates? Yoga isn’t bad, provided you understand specificity and what you’re getting out of it. Yoga is good to enhance mobility and stability of the body, but, hockey players only need it up to a certain point. Meaning, does a hockey player need to be as flexible as a yoga master? Nope. But does a hockey player need to be more flexible than a couch potato? Absolutely. What happens with athletes, since they’re so competitive, they try to be the best at everything. But, you hit a point of diminishing returns pretty quickly with yoga once you have achieved the mobility required to play hockey. Yoga can be done as often as once per week, or as little as once bi-weekly once you have achieved proper movement.